Wellness Federal Credit Union partnered with Hartford Healthcare to host a comedy night to benefit the patients who are seen at Connecticut Children’s Medical Center. The night filled with laughs was a resounding success and resulted in a $500 donation to Connecticut Children’s. The funds also supported the Grace S. Webb School. 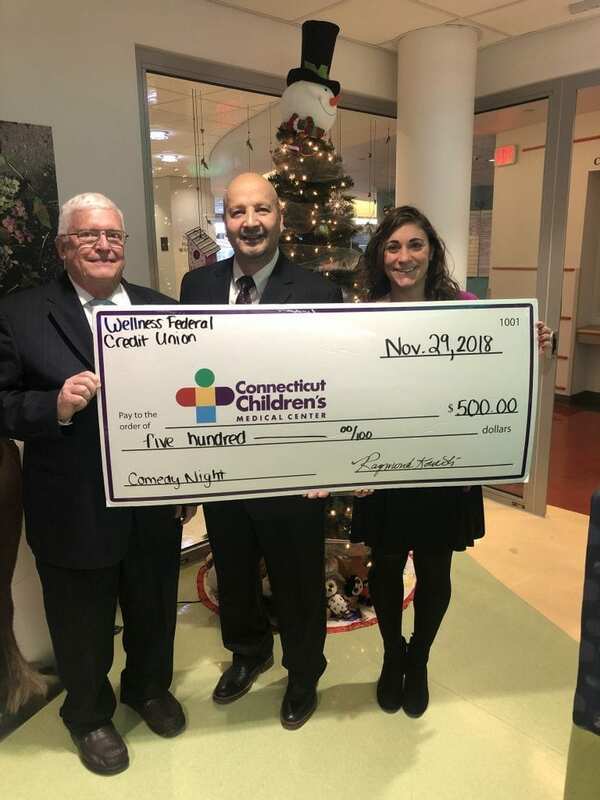 Thanks to Wellness FCU and Hartford Healthcare for coming together to support Connecticut Children’s Medical Center through our Credit Unions 4 Kids program. Raymond Kowalski, left, representing Wellness Federal Credit Union and Angel Rentas, center, representing Hartford Healthcare present a check to Marissa Troiano, right, Associate Manager for Connecticut Children’s Medical Center Foundation.